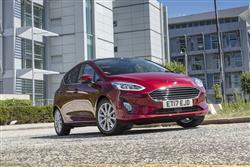 Find out everything you need to know on the new Ford Fiesta from independent vehicle review website Car And Driving. You can watch the video review to the left to see more of the car or read their written review below to get a true insight from an expert in the automotive industry. The seventh generation Ford Fiesta gets a much more appealing petrol engine, a 1.1-litre Ti-VCT unit, which slots in at the foot of its range. Jonathan Crouch takes a look. This seventh generation Fiesta has grown up a bit, but it hasn't lost the youthful, eager feel that endeared previous generation models to so many supermini buyers. Beneath the smarter styling lies some clever user-friendly technology - and cabin quality that'll make down-sizing into one of these less of a chore. It also features a much more competitive entry-level petrol engine, a three cylinder 1.1-litre Ti-VCT unit. What's been the world's most significant car in the last half a century? This is our nomination, Ford's Fiesta, rejuvenated here in MK7 model guise for a fresh generation of buyers. Believe or not, the bodywork's completely new; so is the suspension - and as a result, the driving dynamics are promised to be even better than ever. There's a brand new interior fashioned with much higher quality. And buyers will benefit from a fresh era of media connectivity and camera-driven safety technology. One of the most important changes over the previous model though, was the ditching of that old car's thirsty, inefficient four cylinder 1.25-litre petrol engine. In the place of that powerplant, entry-level buyers now get the three cylinder 1.1-litre Ti-VCT unit we're going to look at here, offered in either 70 or 85PS guises. Variations on the Fiesta theme may come and go, but before driving any version of Ford's definitive supermini, there's one thing you almost always tend to know for certain: that it'll be a great steer. This time round, the Blue Oval brand has sought to retain that traditional Fiesta attribute, yet at the same time, introduce a standard of ride quality closer to that delivered by arch-rivals like Volkwagen's Polo. Out on the road, in some ways, this car isn't quite the sharp, eager thing we remembered from before, but it can still offer a level of handling joie de vivre that's beyond anything its competitors can manage. That's thanks to improved steering, a lightweight body that's now usefully stiffer and an effective torque vectoring system that helps you get the grip down in the corners. Engine-wise, all the volume petrol units are now three cylinder in configuration, the line-up propped up by the new 1.1-litre Ti-VCT powerplant we're looking at here, available with either 70 or 85PS. This engine borrows from much of the brand's EcoBoost technology and has been mated to a manual gearbox that we're told has been freshly-developed for it, despite the fact that it soldiers on with only five speeds. The base 70PS 1.1 Ti-VCT variant manages 62mph from rest in 14.9s en route to 99mph, while the 85PS version improves those figures to 14s and 105mph. It is a bit disappointing though, that with this engine, Ford hasn't fitted the rear disc brakes you get in most other models. Though this seventh generation Fiesta might look much the same, dimensionally it's actually quite a fundamentally altered product, 70mm longer, 13mm wider and 20mm lower than before, plus virtually every constituent part of the car is different. You can see though, why the brand wanted the look and feel of this supermini to stay much the same. The company's European Design Director Joel Piaskowski says he wanted to evolve the styling in a way that would make it more contemporary without losing the essential 'Fiesta-ness' that customers love. That's what's been delivered. Inside, the cabin's much classier. There are flush, seamless surfaces, soft-touch plastic coatings and neat splashes of chrome, plus it all seems to have been very well screwed together by the factory in Cologne. Other than that, the first thing you'll probably notice is the infotainment system that now sprouts in free-standing form from the top of the centre console. The screen options vary depending on the model or options you choose - there are 4.2, 6.5 or, as in this case, 8.0-inch sizes, all featuring pin-sharp graphics, logical menus and fast processor speeds. In the rear, there's 16mm more knee room than there was before, plus the seats are softer and offer greater side-to-side support. The extra body length has allowed the cargo area to be 17-litres larger than it was before, now rated at 292-litres for both three and five-door bodyshapes. Prices for the base 1.1-litre Ti-VCT petrol unit variants stat at around £13,000 and there's a choice of 70 or 85PS variants. Equipment levels are very reasonable this time round. Even with base 'Style' trim, you get air conditioning, Bluetooth with the 'My Ford Device Dock' for your smartphone handset and an 'Emergency Assistance' system that'll automatically summon help should the airbags go off. Other standard features include a 6-speaker audio system, a trip computer, driver's seat height adjustment, daytime running lights, auto headlamps, a speed limiter and a pretty complete package of safety features that we'll over later. Plus there's the Ford 'My Key' system that lets you set certain functions that can be restricted with the spare individual keyfob provided, so for instance, the volume of the stereo or the maximum speed can be limited for younger drivers. As a parent, that feature alone would really sell this car to me. Let's consider this Fiesta's safety credentials. Ford says that the B-pillar and the doors have been re-designed to provide better side-impact protection this time round and every variant is fitted with seven airbags - twin front, side and curtain 'bags, plus one for the driver's knees. For highway safety, all variants get two features you wouldn't expect to see fitted right across the range on a supermini: there's a 'Lane Keeping Alert' system that warns you if you veer out of lane and a 'Lane Keeping Aid' that will automatically steer you gently back to where you should be. One of Ford's priorities this time round was to get the Fiesta's efficiency showing up to scratch right across the range. In the previous generation line-up, the figures you got from the 1.0T EcoBoost turbo petrol three cylinder powerplant and the TDCi diesel units were exemplary - but these were comparatively pricey engine options. In contrast, the returns delivered by the old-fashioned 1.25-litre petrol unit that budget-minded customers often found themselves stuck with at the bottom of the range were terrible. In this day and age, a supermini unable to crack 55mpg on the combined cycle and putting out more than 120g/km of CO2 has an efficiency problem: Ford had to sort it. They have. The normally aspirated entry-level 1.1-litre Ti-VCT three cylinder powerplant we've been looking at here shares much of the technology of the pokier EcoBoost turbo units including, crucially, their engine stop/start systems. As a result, the figures you get are very sensible by class standards, though still not quite as impressive as those of the petrol turbo models. This base engine comes in either 70 or 85PS guises and either way, delivers 64.2mpg on the combined cycle and 101g/km of CO2. Insurance for this 1.2-litre variant is pitched at group 2E for the 70PS derivative, while the 85PS version is group 5E. The Ford Fiesta has always been a vehicle the British public has warmed to, but the truth is that before this seventh generation model arrived, supermini buyers chose this car either because it was great to drive or because they'd been offered a deal too good to turn down: there wasn't really another reason to buy one. This model changes all that, smarter to look at, smarter to sit in, smarter to operate and affordable to buy and run in this base 1.1-litre Ti-VCT guise. In short, this is, more than ever, a small car that supermini buyers simply can't ignore.